The Jardin des Tuileries is the oldest French garden, noted for its impressive geometric architecture. Listed as a UNESCO World Heritage Site, this magnificent public green space is a key place to visit during your stay in Paris. It’s bordered by the Rue de Rivoli, with its magnificent facades and arcade sheltered walkway, and within its verdant surroundings you can find the famous Jeu de Paume Museum, a national gallery of contemporary art. During your wanderings through Paris, you’ll be happy to take a peaceful break in the shade of the trees of the magnificent Jardin des Tuileries. Situated at the crossroads of the most beautiful monuments of the capital, near the Seine, the Comédie Française, the Opera and the Concorde, the Jardin des Tuileries is the perfect place to enjoy the sweetness of the summer air and some blissful peace in amongst your busy itinerary of visits and sightseeing. The loveliness of its layout and the serenity of its splendid water features will make you forget the hustle and bustle of the city and provide a meditative setting where you can totally relax. The extensive lawns seem to have been designed to accommodate long summer picnics, while the various sculptures that populate the park invite you to settle into a timeless reverie. Take a leisurely stroll along the elegant paths of the Jardin des Tuileries and enjoy the perfect balance of nature and the hand of man. The aroma of candy floss pervades a part of the Jardin des Tuileries from June 23rd to August 26th! An annual event, the Fête Foraine du Jardin des Tuileries is back, bringing joy and fun to the heart of Paris. With 60 fairground attractions, including some wonderful vintage rides, this funfair is a tradition that Parisians simply adore, and you will, too. Come with family or friends to try your hand at hook a duck or rifle shooting, give yourself a bumper treat on the dodgems or glide serenely around on a carrousel horse! If you're hungry, this is no time to be watching your waistline, so be tempted by toffee apples, sweet waffles, dripping churros or sticky candy floss, treats that will take you back to your childhood. This brightly coloured fair is a feast of fun for all ages. Entrance to the funfair is free, but there is a fee for the attractions. 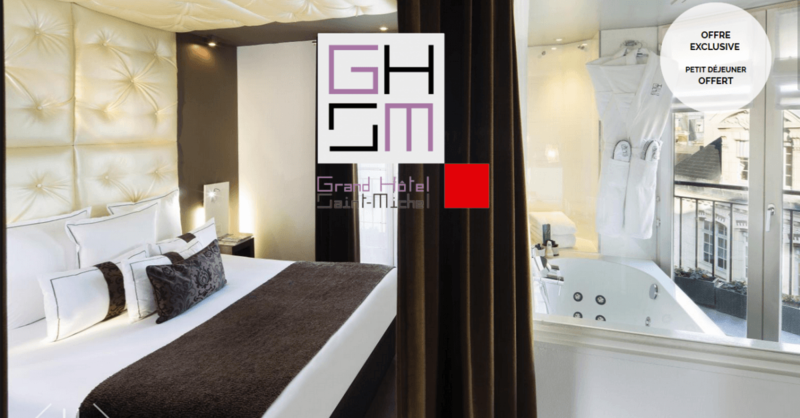 For your Parisian getaway this summer, book your room at the Grand Hotel Saint Michel, a very central, chic and friendly establishment. The upscale rooms are well-appointed, and the contemporary designer atmosphere of the hotel will delight you. Make the most of your idyllic trip to Paris by opting for the Grand Hotel Saint-Michel!